Nearby Attractions - Menino Regency, Panjim : MeninoRegency.com - Centrally Located Hotel in Panjim, the capital city of Goa, India. The church of Our Lady of Immaculate Conception is located right in the heart of the Panjim city and is dedicated to Our Lady of Immaculate Conception. This Church of Our Lady of Immaculate Conception is beautifully lit up at nights on top of the mount and is one of the most important landmarks of Panjim city. This was reportedly one of the first Churches to be built in Goa, estimated around 1540's. It was built there because of the high ground it stood on. It was rebuilt in 1619. 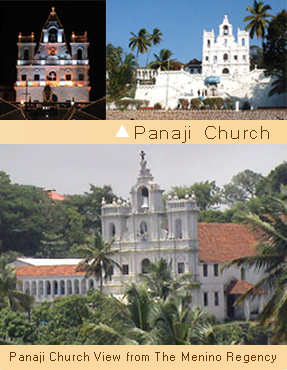 After Panjim became the capital city, the great bell of the Church of Our Lady of Grace in Old Goa or the "Bell of the Inquisition" was moved to this church from Aguada in 1841. At the same time, the renovation created the four tiered steps leading to the church. The interior is simple and is dedicated to Mary. There are two altars on either side, the one on the left dedicated to Jesus and the one on the right to Our Lady of Rosary. On either side is a statue of St Peter and St Paul. In the south transept to the right of the main altar is the Chapel of St Francis Xavier, with his statue. It formerly stood in the Idalcao's Palace and was moved here when the chapel there was dismantled in 1918. Mahalaxmi Temple Two Minutes walking distance. 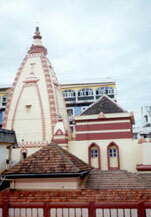 It was the first Hindu temple allowed to be built by the Portuguese in Goa after 300 years. It was approved by the Portuguese authorities in 1818 after a long delay and built subsequently. It was most recently renovated in 1983. The deity of the temple originally came from the village of Taleigao and was moved to Bicholim in the 16th century to escape Portuguese destruction. For a short while during the approval process for building the temple the deity remained at the house of Mhamai Kamat, near the Idalcao's palace. Boca de Vaca Three Minutes walking distance. Boca de Vaca spring in Goa is said to contain medicinal properties due to which many tourists as well as locals flock here. “Boca De Vaca” is a Portuguese name meaning “Mouth of a Cow”. This name was given by the Portuguese themselves, probably due to the shape in which this structure was built. Recently it has been renovated by Goa Government. It now has a glass flooring through which underwater fish can be view. 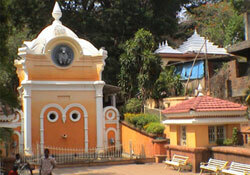 This spring is located near the Mahalaxmi Temple at Panjim (North Goa) Near Mahalaxmi Temple, Panjim, Tiswadi , North Goa. Caravel is 215 ft. long cruise ship can comfortably accommodate 300 people. Docked at Panaji, the capital of goa it promises and eventful evening out. The caravel sets out into the blazing sun, past the old secretariat (Adil Shah's Palace), Fort Aguada, the fishing boats and into the Arabian sea. While sightseeing on the upper open deck is invigorating, the more adventures can enjoy American Roulette, Black Jack, Rummy, Stud Poker, Baccarat, Pontoon and Flash. Players are dealt to by dealers specially trained (under expatriate supervision) to conduct gaming sessions with internationally accepted standards. For the light hearted among you there are Reel and Poker slot machines as well as upper deck entertainment and a wonderful sundeck bar. Other facilities includes:- 3 standard rooms and 2 suites, 1 private gaming room, casino bar, safe deposit locker, open air swimming pool (seasonal). Air conditioned multi-cuisine buffet restaurant, below 18 years TV/Video game room. Toddlers room with trained Baby sitter. International safety standards maintained. Shuttle service at regular intervals. The Goa Kala Academy established in 1969 is the prime institution for promotion of art and culture in the state. It functions in collaboration with more than 100 institutions. The Kala Academy complex situated on the bank of river Mandovi provides facilities for art education, performance and development. The complex includes an open air auditorium of capacity 2500, a closed air conditioned of capacity 1000, two mini-theatres, black box with modern recording facilities, full -fledged library of music (tapes and discs) and books, art gallery and works. Miramar Beach is 3 kms from Panaji. A lovely golden beach of soft sand girdled with palm trees facing the blue Arabian Sea, is the nearest to Panaji. Miramar is almost part of Panaji. It is one of the most popular beaches. If you wish to watch the sunset from Panaji then the best location would be this beach, which is fifteen minutes' walk along the riverfront avenue called Dayanand Bandodker Marg. Miramar is an urban beach where the Mandovi River meets the Arabian Sea. Dona Paula in Goa, lies in close proximity of Panjim City and is one of the most popular destinations and tourist spots in Goa. The name ‘Dona Paula’ came about from an old story where a lady named Paula committed suicide since she could not keep up to her love commitments. ‘Dona’ is a Portuguese word for ‘Madam’. 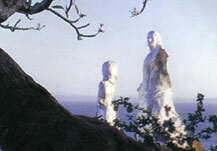 A statue of her and her lover was built at the place from where she took the fatal jump of her life into the sea. A comfortable drive through the sea is enjoyed by many a tourists through the Water Scooter rides available here. Along the road side one can see stalls selling clothes at a cheap rate that are purchased by many tourists. Besides this a lots of bars, restaurants and resorts are located in this area.